We are pleased to announce you that your Web site has been approved by our jury and we are proud to reward you with our BRONZE Award. Because this award is really hard to win, your site is considered as a very good contribution to the online community. This award symbolizes overall a high standard in design and content and we will be honored to see it on such pages as yours. Your site was rewarded for originality, easy navigation, content, outstanding graphic design and was found error free. We really enjoyed surfing your site, and we are sure everybody else will too. Again, we extend our sincerest congratulations to you for the hard work you invested in creating this successful Web site with that famous artistic "French Touch". Great site! I found it extremely interesting and user friendly. Congratulations! 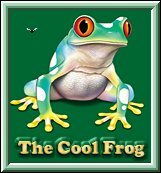 Your site has just won the Cool Frog Award for excellence in design and content. Really enjoyed the visit! John, and the crew at Frog Creations. Congratulations! Your Site scored 89/105 - prestigious award! You showed some very good skill, very pleasant graphics and good knowledge of HTML. I do have a weak spot for Italy so maybe I was a little less strict, but in general, I had a splendid time on your Site. CONGRATULATIONS !!! I choose you as a winner after reviewing your site. The page is great, amazing, extraordinary and I enjoyed the visit. I'm offering you this award for all your work. and Have a fine day! 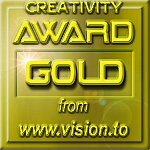 Congratulations the VISION.TO AWARD has reviewed and approved your site. Excellent Design. Best regards from www.vision.to (Vision.To Design)! We are aware of the time and effort that goes into creating a successful web presentation. First of all, we thank you for inviting us to your fine and the opportunity to review it. Your website was reviewed by one or more of our evaluators, and it gives me great pleasure to report that your application was successful, and present you with my Choice Award! Once again, we thank you for the opportunity, and congratulations with your achievements! Thank you for submitting your site to the Dominien Eye-catcher Award. We have reviewed your site and you have won. herzlichen Glueckwunsch zum Gewinn des Cyberman Awards in Gold. Eine so schoene Seite habe ich seit langen nicht mehr im Internet gesehen. Einfach nur schoen. Sei so nett und verlinke den Cyberman Award, wenn Du Ihn in Deine Seiten eingebunden hast. Danke. Barbara Tampieri Home Page has received the Sandy's Gold Award. This award is not an easy one to achieve and please except my Congratulations! We have reviewed your site and would like to present you with our Bronze award. We all enjoyed your site and the guest artist of the month was a great idea! Thank you for applying for my award and giving us the chance to review your site. Yes of course you may have my award. If nothing else your site has improved over the last visit. I am happy to call you web friend. I have evaluated your site according to my new criteria and you have scored 92 with the following motivation: " A talented artist with much time spent in bringing this wonderful site to the Internet. All categories are within a very high range. Thank you for sharing this creation with us."